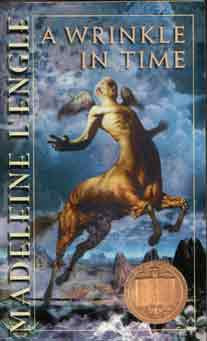 Author Madeleine L'Engle died yesterday at age 88. She wrote one of my all time favorite children's books, A Wrinkle in Time. The book told the story of misfits Meg Murry and her brother Charles Wallace and their journey to find and rescue their missing father, with the help of their friend Calvin and three strange women--Mrs. Which, Mrs. Who and Mrs. Whatsit. The novel has elements of science fiction, fantasy, allegory and classic themes of good vs. evil and the power of love. The ending still makes me cry. The book was adapted into an ABC TV special several years ago--and they completely missed the mark. Horribly miscast, muddled and a total mess. The climatic part of the story comes when Meg goes back to Camazotz--a planet overshadowed by the evil of IT--to rescue Charles Wallace, who has also been taken over by IT. Before she goes, Mrs. Which tells her that she has something IT does not. And that this something is her only weapon against the evil IT. When Meg gets to Camazotz, she meets Charles Wallace--or rather the thing that looks like the shell of her beloved baby brother. She racks her brains trying to figure out what she has that IT hasn't got. Charles Wallace tells her, "You have nothing that IT hasn't got." He says he knew that Mrs. Whatsit would send her--because Mrs. Whatsit is "our friend." Meg angrily tells him he is lying and Charles Wallace says, "Mrs. Whatsit hates you." And that's where IT makes its fatal mistake. Because Meg knows that Mrs. Whatsit LOVES her. She specifically told her, "I give you my love, Meg. Never forget that. My love always." And Meg realizes that it is LOVE that she has that IT does not. So she focuses her love on Charles Wallace. Willing him to come back from the clutches of IT. Tears streaming down her face. Over and over until she gets through to him and releases him from the hold of IT. And he runs to her sobbing and they embrace, their tears mingling. It's a powerful scene. It's the money scene. Everything in the story has been building up to this ONE IMPORTANT MOMENT! And they completely botched it. Aaaaaarrrrrgggggghhhhhh! Well, at least we still have the fabulous book.